Today I was reading Kevin Baughen’s Penguin Blog, ‘Which charity brand will be the first to jump on admin costs? And it reminded me of couple of sessions that I saw at the FIA Conference earlier this year. 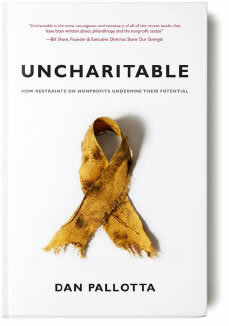 Dan Pallotta, author of Uncharitable and founder of Pallotta Teamworks spoke about how charities overheads are perceived by the public, media, government and their own staff. Dan challenged the popular belief that the more of a donation that goes directly to services and the less that is ‘wasted’ on overheads including salaries, staff development and administration, the more effective the charity. He spoke about expectations that charity staff should be paid far lower than their equivalents in corporate organisations, and receive less investment in personal development and training, because they are compensated by the ‘feel good factor’ of working for a ‘worthy’ cause. Dan used an example of soup kitchen A and soup kitchen B to illustrate his point. Soup kitchen A reports that 90% of every donation goes to the cause; soup kitchen B reports 70%. But what you don’t know from this topline statistic, a statistic from which many people base their decision on which organisation to support, is that soup kitchen A serves rancid soup in a run down building with unfriendly staff, while soup kitchen B is open all the time, employs friendly staff, serves hearty nutritious soup in state of the art facility and also does case management. In this scenario when making a decision on which organisation to support, the percentage that goes to the cause is not a good question. A better question would be; which charity makes the most difference? Many charities are apologetic about the costs involved to raise funds. Almost half of charities claim that there are no costs associated with their fundraising. The lack of transparency regarding expenditure required to deliver sustainable fundraising only exacerbates public, media and government perceptions that somehow charities should fundraise for free, and that donors should expect 100% of their donation to go directly to services. Adrian Sargeant in his Masterclass on ‘What every board should know about fundraising’ raised a similar point. He commented that “If the best thing we can say about our organisation is how much it costs to raise a pound then that’s a bit sad.” The most important measure is the difference that a donor has made. Adrian went on to highlight that in the UK we lose 50% of new donors in the first year. Then 30% year on year. In 2007, 38% of donors stopped giving. Over half of those stopped because they no longer felt personally connected. So, if we don’t continue to engage and build relationships with donors the initial cost of recruiting those donors is wasted. Developing long-term relationships requires investment. It simply can’t happen for free. Charitable organisations must continue to invest carefully in their fundraising and at the same time be bolder and more transparent about the real costs involved in running an effective sustainable fundraising programme. This paradigm shift has to be led from within the sector. It is the responsibility of charities to change the perceptions of the public, media and government and help them understand that fundraising efficiently does indeed cost money. Kay Sprinkel Grace described fundraisers as brokers of dreams, giving supporters the opportunity to make a difference to the world. Yet our big dreams and ambitions, and those of our supporters are often reduced to apologetic conversations about how much it costs to raise a pound. How can you be bolder about the real cost to raise a pound? And more importantly how can you show your donors that their donation to your charity will make the biggest difference? This entry was posted in blog, book review, fundraising, ideas, Innovation, insight, Inspiration, leadership and tagged admin, admin costs, Adrian Sargeant, ambitions, brand, charity, Dan Pallotta, donation, dreams, feel good factor, FIA, fundraising, Fundraising Institute Australia, Kay Sprinkel Grace, Kevin Baughen, making a difference, paradigm shift, penguin blog, perspective, soup kitchen, Uncharitable. Bookmark the permalink.